“‘GROTESQUE’ is the new LP by The Fall .. 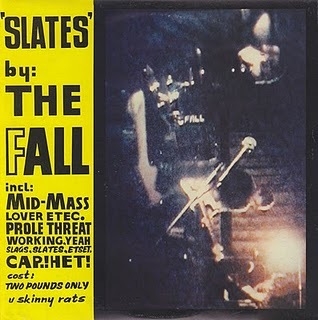 The Fall are the group who keep being brought up and slagged by other insecure bands – this automatically invokes a curse on them which usually takes its toll. This is true. Most people who like The Fall don’t like other groups anyway and don’t own coffee tables. JOE TOTALE: As he writes this weak TV rock filters through from the adjoining room. SMITH SAID ‘78 was the year of the average man. WELL IF That’s true ’80 is the year of the average band. The Fall are the GROTESQUE EXCEPTION. ON this LP Every class gets what’s COMING TO IT. MY FATHER said: THE FALL WILL OUTLIVE YOUR SINS.